Locally based Cram Roofing Company, Inc., continues their partnership with the Boy Scouts of America, Alamo Area Council in San Antonio, to raise money for its Scouting programs. “We’re pleased to have Cram Roofing as our main event sponsor and Oak Hills again this year as our Tournament venue. We had great participation last year – a historic A.W. Tillinghast layout in superb condition enjoyed by all players. We anticipate a full field which will result in a significant financial benefit to our various Scouting programs,” says Jimmy Allen, Tournament Chairperson, Council Executive Board Member and Group Executive Vice President at Broadway Bank. 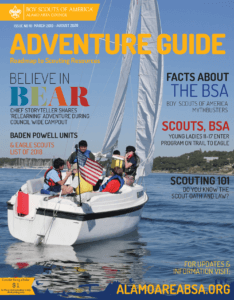 “Cram Roofing is proud to be involved in the Boy Scouts. We know that our youth will be tomorrow’s leaders,” said Gary L. Cram, Founder and President at Cram Roofing. Oak Hills Country Club will host Scout supporters and sponsors to raise money for Scouting programs council-wide. Scouting programs supported include Project Aguila, a board initiative to create long-standing Scouting units in new areas of need, and ScoutReach, an in-school program that serves over 4,000 at-risk youth. “The best part of Scouting happens outdoors, so come out to Oak Hills and play your best golf with some good friends to benefit great kids,” says Michael de los Santos, Scout Executive for the Boy Scouts of America, Alamo Area Council. The four-player scramble tournament officially starts at 11:30 a.m. with a $10,000 putting tournament elimination round and other competition. There will be contests for longest drive, closest to the pin, and hole-in-one WIN A NEW CAR contest. Cram Roofing is also sponsoring a one-of-a-kind fundraiser, the “Cram Roofing Ball Drop” during the event; where four lucky winners could take home up to $5,000 in prizes. Sponsored golf balls, purchased at $10 each, will be dropped from a crane onto the green at the Oak Hills Country Club with the four closest balls to the pin are declared winners. Reception, raffle, and an awards dinner will immediately follow the tournament. For more information on the event, visit www.BoyScoutGolfClassic.org or contact Courtney Bukowski at 210-296-7623 or via email at Courtney.Bukowski@Scouting.org.